Please note, this article was written back in 2009. While the main points are still valid some of the prices will have changed. A good piano in poor condition is still a poor piano. Conversely, a medium-grade piano in good condition may be the better investment. 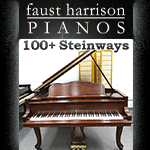 The following is a list of piano manufacturers that made highly regarded pianos pre-1930. The reason 1930 is the cut-off point is that during the Great Depression many piano makers, both good and bad, went bankrupt, and their names were bought up by the surviving companies. In some cases, the defunct company’s design continued to be used, but most of the time, only the name lived on. This list is from “The Piano Book” by Larry Fine. As Mr. Fine states, this list is not complete , or universally agreed upon, but is merely a guide. seeing it. The values below are for reference only. 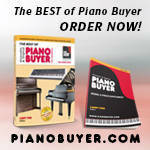 Your local piano tuner-technician is still your best resource! piano from a technician instead of a private owner. (sometimes as much as four) the above prices. the “depreciation” method. This method is especially useful for appraising pianos of recent make when the models are still in production. To use it, one needs to find out how much a new piano of the same or comparable make and model would cost now, and then look up the age of the subject piano on a depreciation schedule.The percentage given represents what the piano is worth relative to the cost of a new one. There is no universally agreed-upon depreciation schedule for pianos, but one such schedule is provided below. This method works fairly well for pianos of average quality which have had a normal amount of wear. For better quality pianos, or pianos that have had either very little or far too much use, the values produced this way must be adjusted accordingly. Depreciation schedule courtesy of Stephen H. Brady, RPT, Seattle, Washington. Reprinted from – The Piano Book by Larry Fine.